Before getting in to the ACF Fiorentina update I am pleased to announce that I am now part of the FM Base blogging team after being invited this last week. I am looking forward to the link up with FM Base and producing some extra writing for them alongside my current save updates ect. I have a few ideas going forward that will mix my writing up a little over the remaining of FM19 with Fiorentina and going forward in to FM20 with Argentinos Juniors. What is success in Football Manager?. I think it all boils down to the individual with some people enjoying winning trophy after trophy and others happy in lower league management fighting against relegation or trying to win promotion on a shoe string. We all have our own favourite way of playing the game and the type of club we manage. 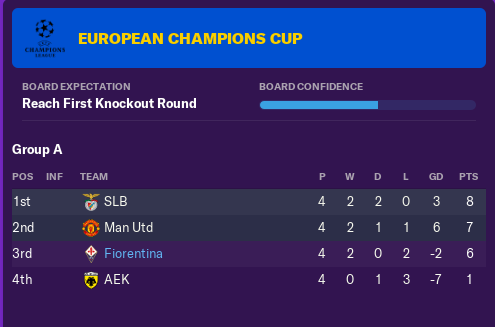 The reason I have asked the question to myself is on the back of last season at Fiorentina were we came 2nd in the league, reached the Semi Final of the Champions League, was runners up in the Coppa Italia final and won the Italian Super Cup now to me that is a successful season despite going close to a potential quadruple. So in four seasons we have won the Serie A title once in my 3rd season and the Italian Super Cup once in season 4 and appeared in two Coppa Italia Finals in both the 2nd and 4th seasons losing twice on penalties to Roma. I have kept the faith with my tactical system the Viola 433 which is a good system but by no means a game breaking system and that is the way I like it. I enjoy analysing matches and tweaking the system from time to time making errors along the way or sometimes improving the system whichever it all makes for a good game experience. 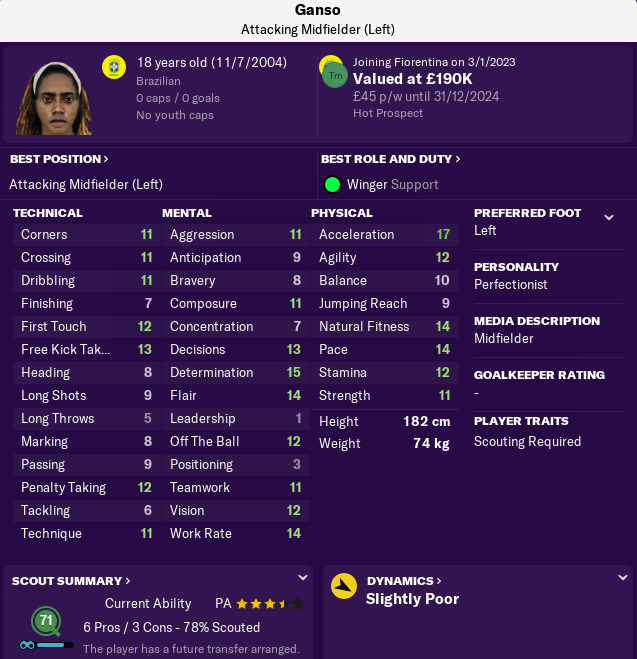 We had a pretty steady summer in the transfer window with us just signing 18 year old Brazilian Ganso from Gremio, Ganso is a newgen left winger who will join us in January for £2m. I like the look of the young Brazilian and look forward to him joining so that I can mould him in to our system. The emphasis for me now is on our own youth development so we won’t be signing anybody above the age of 18. Any first team players who leave the club will be replaced from within. After a decent pre season we kicked the season off in the Franchi against Frosinone in what is an early start for the Italian season which is doing so in line with the rest of Europe to accommodate the winter World Cup. Both Domenico Berardi and Rafik Zekhnini got on the scoresheet in a 2-0 win. Rafik Zekhnini hit the back of the net again on Matchday 2 on the road against Napoli in a 1-1 draw. Jose Mourinho managed to hold on to his job after rumours of his departure echoed the last 6 months. Udinese were the visitors to Florence on Matchday 3 and in form Rafik Zekhnini managed to net his 3rd goal in as many games in a convincing 3-0 win, both Sandro Tonali and Abdou Diakhate were amongst the goals. We are having a little bit of an injury crisis with our forwards at the moment with Romero, Gentile and Joveljic all carrying knocks. Matchday 4 threw up a trip to Turin to face our big rivals Juventus who scuppered our chance of retaining the title last season along with knocking us out of the Champions League at the Semi Final stage. You could say we that we travelled to Turin wanting to avenge last seasons woes and with just 3 minutes left on the clock it looked liked we had earnt a creditable and deserved 0-0 draw but no wait for it, our ever dependable central defender Alessandro Bastoni decides to pass the ball back to our ever dependable goalkeeper Alban Lafont from around 30 yards away from our goal with no Juve players in sight and guess what the ball manages to pass Lafont (who is stood around 15 yards away from his goal line) to nestle slowly in to the back of the net. Now at this moment in time I should get up and kick the water bottles in to oblivion but due to the nature of that we are playing a PC game my daughter would not appreciate me driving her gymnastics water bottle straight threw the living room window……. it was a close thing though. Just a minute later Juventus double their lead courtesy of Koulibaly (a very good newgen). Patrick Cutrone did score an injury time consolation goal but it was all too late but the water bottle did survive. Dusting ourselves off we headed to Milan from Turin to face Internazionale and pay a visit to our old friend Federico Chiesa. Our old friend was in no mood to let us walk in to the Meazza and claim all three points in fact it was a solid performance from our backline that enabled us to escape with a 1-1 draw and of course a goal from Sandro Tonali. September started well with a 1-0 win at home to Sampdoria with our only fit forward Patrick Cutrone getting the winner against a Sampdoria side who at this point were undefeated. Champions League opening group game was next as we visited Old Trafford to face Manchester United who took us to the cleaners and back beating us 4-0 in what I can only describe as being our worse performance during my time at the club. I really don’t know were to start other than we were awful on the night. The players got nothing short of a roasting and a kick up the arse before our Matchday 7 fixture away at Pro Vercelli were I wielded the axe and dropped all eleven starters from our midweek shambles. I am not frightened in upsetting a few players from time to time but they deserved it. The Chosen eleven played well with Prince Bakouboula and Federico Ceccherini playing well despite us shipping two goals in a 3-2 win that saw Sandro Tonali step up to the plate with two of our goals and Ivan De Stefano getting in on the action with our other goal. The Artemio Franchi waited in anticipation for the midweek visit of Manchester United for Champions League 2nd group game which feels a bit weird having back to back games against the same opposition for the opening two games but anyway we really needed to step up our performance after the Old Trafford debacle. Like I have said before I am always going to favour our system of play which you can describe as either a 4-1-4-1 or 4-3-3 Wide Formation but after analysing our game at Old Trafford I really felt that I needed to make a tweak to the system to counter United’s midfield dominating us for a second time. Do I put an extra man in the centre of the park? No I decided to go with a Libero which you can read about below in The Ponte Vecchio section, so all I will say here is that it was a cracking match. Serie A Matchday 8 took us to Rome to face a Roma side who are looking to continue their unbeaten start to the season. We reverted back to our normal system and dominated the first half leading 1-0 at the break through a Fabio Gentile strike. The second half was a different story Locattelli, Barella and Biraghi all limped off with injuries and Roma dominated getting two quick fire goals in the process to inflict a defeat on us 1-2. It was time for our third group game in the Champions League with AEK visiting Florence to round off the month of September. The game was won 2-0 with a goal in each half via Nicolo Barella and Fabio Gentile. We should have won this game by more goals but the three points are in the bag. 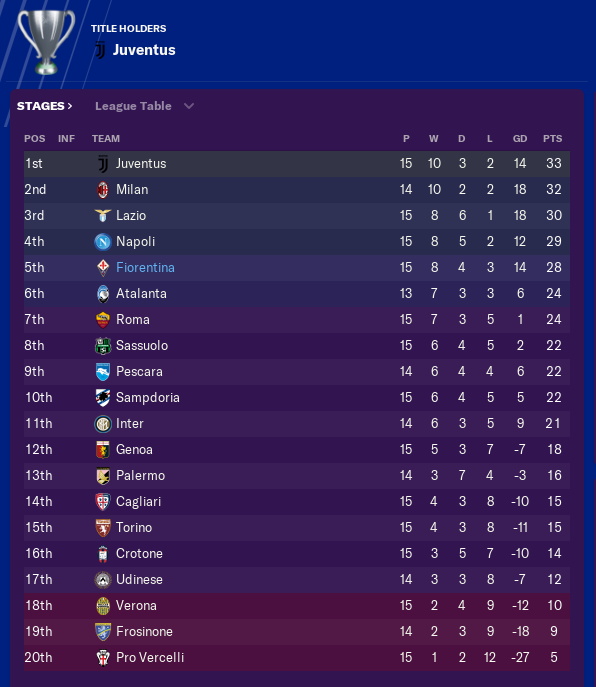 A busy month with 8 games started with a very good 2-1 win against league leaders Milan thanks to Domenico Berardi and Sandro Tonali in a game that saw us put in a really good performance limiting Milan to just a single chance which they scored from in 84th minute to make the last minutes a little of the game a little nervy but thanks to a stunning Tonali strike we claimed all 3 points at the death of the game. A disappointing 0-0 draw at Hellas Verona was followed up by a 3-0 win against Pescara in the Franchi were 18 year old French midfielder Luther Gendrey made a man of the match performance with an assist in a 3-0 win that saw our midfield duo Nicolo Barella and Manuel Locattelli get on the score sheet along with Domenico Berardi but it was our young development squad player a Gendrey steel the limelight with a quality performance. It was Domenico Berardi who stole the show this time with a brace in our 2-0 win against Palermo but we then failed to produce the goods in our next two games the first being a 0-1 defeat to Benfica in Florence on Matchday 4 of our Champions League campaign that leaves us in 3rd place with 2 games to go away at Benfica and away to AEK which we will need to register 4 point minimum to have a chance of reaching the knockout rounds. And our second defeat came at the hands of Marcelo Bielsa and his Atalanta side who are pushing for continental football. Fabio Gentile scored our consolation goal in the 1-2 defeat. The Italian media were waiting in anticipation of the national teams squad announcement ahead of the World Cup in Qatar and when it was announced manager Maurizio Sarri had named 5 of our players in his final squad Luca Pellegrini, Manuel Locattelli, Sandro Tonali, Nicolo Barella and Patrick Cutrone all got the nod however Alessandro Cortinovis was unlucky to have been left out. A much needed 4-0 win against Sassuolo saw the return from injury of Patrick Cutrone who marked his Italian World Cup squad selection with an hat-trick to sink our visitors. The ever dependable Domenico Berardi was also on the scoresheet but picked up a slight knock that will keep him out of our trip to face 3rd placed Lazio in Rome ahead of the World Cup break. The visit to Rome provided an entertaining game with both ourselves and Lazio going all out for the points but it was the backline that came out on top in a 0-0 draw that leaves us in fifth place going in to the World Cup break. All in all United dominated us in every area and when I looked back at their previous games this season the picture was pretty much the same they were dominating teams in the Premier League. I needed a plan so in between FM sessions, work and family life the return game was playing on my mind, yes a game that involves watching dots if you are like me and prefer 2D running around on a screen. How would the great tactical minds of days gone by deal with this United bandwagon? Sacchi, Michels, Guardiola, Cruyff and Bielsa managers who I hold in high regard but it was not one of these greats that sparked a brain wave in fact it was not even a person it was the bridge named Ponte Vecchio, the very bridge that takes centre stage in all my banners at the top of each Florence And The Goal Machine posts. I was looking at some pictures of Florence and thinking that one day I will visit Florence with my family when the very next picture that I came across was the Ponte Vecchio bridge in all its glory. Now I don’t know about you the reader but my brain seems to see patterns but not just any patterns but football tactical patterns for example a month or so ago I saw Louis Van Gaal”s Ajax system at work on a set of carpet tiles laid in different variations, yes I know I should probably see my doctor but well it’s not hurting anyone is it? Ok so back to the Ponte Vecchio, I was just looking at the picture of it the one I use for my banners when I imagined the defensive line that I was thinking about using the bridges structure to determine coverage of the half spaces that United dominated just a few days earlier. I was starting to paint a picture in my head of how I could set the side up to play in a way that would stop United running amok in the Artemio Franchi? What would the grandmaster himself do in moments like these? Yes I have turned to one of the best tacticians the World as ever seen in former Chess World Champion Gary Kasparov. I worked with a chap a few years ago who was big in to chess, he played for a team each week and in conversation I used to ask him about the game and I remember asking him who he thought was the best ever chess player, he replied without doubt Gary Kasparov and continued to tell me about how attacking Kasparov was and how in one particular match he sacrificed his own queen just 12 moves in to the match to pull off a tactical masterclass against Antoly Karpov. I wanted to revisit that match I say revisit I have never watched it before but I heard a lot about it trust me. So I decided to spend a few minutes watching the footage of this classical encounter to try and and gain some inspiration and it worked. I knew what I wanted to do now in my head but I now needed to translate this on to the pitch. I talked about moulding players in to a system in my last post which covered my player development system that involves moulding players in to a system. The formation that we use at Fiorentina is a 433 but this game against Manchester United I was prepared to change the formation and one role in particular. Like Kasparov I was prepared to make a sacrifice and that sacrifice was the ball. Yes you have read it correctly I am going to let the team who destroyed us 4-0 just 8 days earlier have the ball. I am not interested in going head to head with the Red Devils for the ball but I do want to set a trap. By employing the Libero between two central defenders it will push both the central defenders wider than normal in the hope that it will enable the full backs and central defenders to play closer to each other to help us cover the half spaces that United exploited at Old Trafford. By being closer together it also offers the chance to double up quickly and also cut the passing lanes off. The Libero Locatelli will step in to the midfield zone and hopefully in my head become a spare man with Sandro Tonali our deep lying playmaker playing deeper and Nicolo Barella pushing on in the mezzala role enabling Locatelli to ghost in and out of the midfield becoming a false 10 (I know I Know people get carried away with putting false in front of everything but it’s the best way that I can think of describing how I see Locatelli functioning in the Libero role in this system) I think what I am trying to say is by getting Locatelli forward he has the passing quality to open up the United defence. Alongside Locatelli in central defence I chose to play Federico Ceccherini and Prince Bakouboula dropping both our 1st choice defensive pairing of Bastoni and Mancini, you think that’s a gamble in goal I gave the gloves to 17 year old Alberto Scotta. I have faith in this youngster and give him a big chance on the biggest stage. Kevin Diks comes in at right back with Cristiano Biraghi filling in at left back. Sandro Tonali and Nicolo Barella will play in central midfield whilst the front three is made up of inside forwards Rafik Zekhnini and Domenico Berardi with Dejan Joveljic playing in the false nine role. The pre match press conference questions were focused on my team line up and the change in tactic that I had introduced but I was not giving anything away. Inside I knew I was taking a gamble on both accounts but sometimes you have to test yourself and I felt that the time was right after all we took an hammering at Old Trafford. The Franchi was buzzing with anticipation as the players emerged from the tunnel, the TV cameras were focused on our captain for the day Domenico Berardi leading the side out against a backdrop of purple smoke, this definitely had the feeling of a European night. United in their red shirts got the game underway and immediately attacked the right flank but Biraghi dealt with the threat comfortably and rolled the ball back to Scotta giving him an early feel for the ball on his senior debut. The early exchanges were made in the centre of the park and I have to say we looked comfortable and in the 12th minute central defender Prince Bakouboula was quick to thwart United’s Mauro Icardi and release Sandro Tonali with a simple pass Tonali switches the play from right to left picking out a pass for Rafik Zekhnini who passes his man and heads inside were he finds Nicolo Barella with a short pass, almost in an instance Barella finds Dejan Joveljic on the edge of the United area with his back to goal, the Serbian forward lays the ball off to the oncoming unmarked Locatelli who strikes a first time shot against the United upright. That was close and the idea of Locatelli roaming free definitely worked in this instance. That close shave for United sempt to lift them and we have to sustain a long period of United attacks but with 30 minutes on the clock United have only registered 3 shots and none on target. The Viola wall is holding firm. I am pleased with the boys so far both Federico Ceccherini and Prince Bakouboula are playing well and both Sandro Tonali and Nicolo Barella are working hard in our midfield. Alberto Scotta is called in to action in the 39th minute and he is equal to the task turning a Rashford free kick around the post. 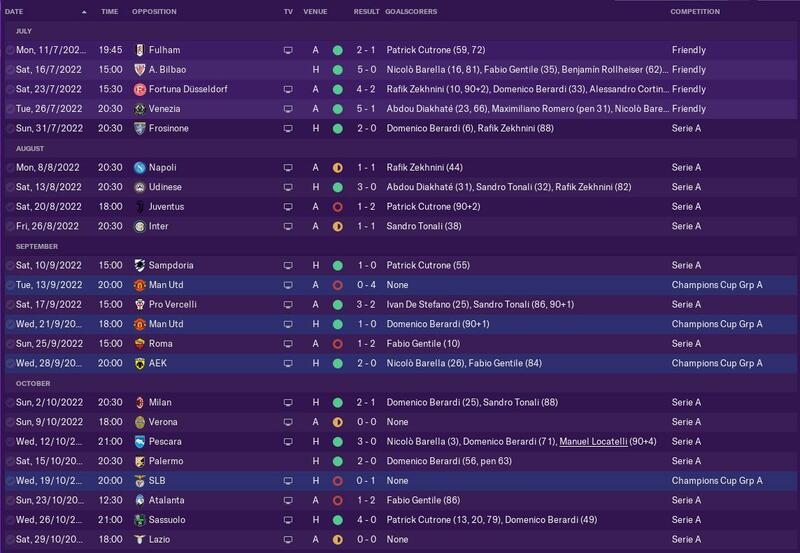 If anything during my time so far at Fiorentina I have not been afraid to choose youngsters in my first team. The half time team talk was simple I needed to give the boys a message to send them out motivated so I went with an assertive “I am not happy with the way you played” it’s just psychological because I am very happy really with the way we played in stopping United’s goal threat. On to the second half and very much of the same pattern with United having a lot of the ball, but our defensive performance is something special and when I say that I really mean it the whole team are defending in a unit. We do have a slice of luck when in the 54th minute Icardi should have scored after my masterplan is undone when Locatelli gets caught out of position that allows Hirving Lozano to slide a pass through to the Argentine marksman who pulls his shot wide from 10 yards out. The possession stats are 38% to 62% in favour of United but apart from the glaring Icardi miss United are being frustrated and when ‘The Prince,’ Bakouboula picks out Joveljic with a long ball over the top United have de Gea to thank for keeping the scores all square. 70 minutes on the clock I decide to roll the dice and introduce Patrick Cutrone on for the tired Joveljic. Just 4 minutes after coming on Cutrone picks up a card for a foul on the United keeper, he needs to calm down so I get a message on to him to calm down. Paul Pogba tests young Scotta with a curling shot from the edge of the area but the young Italian denies the French midfielder with 84 minutes on the clock. United are pressing for a winner but we are holding firm and have a chance of our own when Rafik Zekhnini goes close with a shot from distance. The game looks like it will end all square entering injury time when Bakouboula picks up a loose ball from Herrera in the United midfield and plays a ball over the top to Zekhnini out wide on the left the inside forward goes to run at the United defence but checks back and plays a square ball inside to Locatelli who takes a touch and looks to advance forward before a short pass to Barella who takes it in his stride and plays a through ball to Domenico Berardi who only goes and smashes the ball in to the roof of the net…. The Franchi goes in to a frenzy and the referee blows his whistle for full time. I just can’t express how pleased I am with the result and the young boys who played their part. Did the system work ? For a one off game it shows me that it’s good to have a plan b because it can break a cycle. I will never know that if I played our usual 433 what the result would have been, we could have won 3-0 or lost 4-0 however I bloody enjoyed trying something different. Well that brings me to the end of this post and I can say for sure that we will be reverting back to our preferred 433 for the remainder of the season and going forward. What this last week or so taught me though that sometimes it’s good to be reactive instead of pro active all the time and whatever I think to the system that we used to beat Manchester United I can safely say I really enjoyed it for a change. Great post mate, really enjoyed this one.